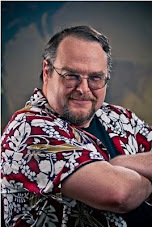 I’m Steven Schend, a former coworker of Jeff's from TSR and Wizards of the Coast, and I'll admit that Jeff taught me a lot over the years as a game designer, editor, writer, and publishing professional. I owe Jeff enough already as a mentor and friend that I need large trucks in which to haul all the beer with which I repay favors and kindnesses. Today, Jeff’s been kind enough to invite me in and grant me his blog space to talk to you about something a block or two off of Grubb Street. I wanted to publish a fantasy work first as that’s where I cut my teeth as a writer and storyteller. Also, my approach to this world is darker than my usual work. Kharndam’s stories won’t provide obvious moral compasses for readers; hat or flag colors won’t reveal who’s a hero or villain, though actions will…as will magic. Fantasy tropes allow us ways to get at the real truths too often inaccessible in our mundane world. Magic even exposes hidden secrets a character or narrator might choose to keep hidden, and secrets lie at the heart of this world and this work. I’ve planned Secrets, like Dragons… to encompass 350 to 400 pages of fiction and side matter from five different authors, and it’s available as a PDF, trade paperback, or hardcover book. I want as many folks as possible in on the ground floor of this new world and new company... There are a number of benefits to donating early at Kickstarter, and we'll be revealing a few more over the last week of our project, so please check back as often as you can. On May 29, 2011, our Kickstarter fund-raising drive ends, and I truly hope we can meet its financial goals. The funds allow me to pay authors and artists (and others behind the scenes) solid professional rates for their work. That’s a no-brainer for me, as both a creative and as a publishing professional, even if it makes the start-up more costly. The start-up budget also accounts for producing the physical books and mailing them to early patrons and benefactors (and a few reviewers, to be honest). Whatever the outcome of this project and drive, please know that I appreciate any and all attention and time you can spare over at Kickstarter.com or at my own site where there’s a few more posts about the project. PS: Only now did I realize that I never answered the sub-titled question. Here goes…. Secrets, like dragons, grow more powerful when hidden…at least in fearful minds. Secrets, like dragons, can sleep for decades before wreaking havoc with their revelation. Secrets, like dragons, are at least as deadly as those what spawned them. Secrets, like dragons, may mitigate the damage they unleash if treated with respect. And, at one of our author’s suggestions….Secrets, like dragons, are more noisy in taffeta. Nope, not Raptured. Just very busy at the moment, with the day job, the not day job, and a trip back to visit family. However, I want to cede the floor to a long-time friend and fellow writer, Steven Schend, who is trying to Kickstart a project. Kickstarting is an old thing made new by the Internet, where people pledge funds to get a project off the ground, and only have to kick in if the project is becomes fully vested. Steven's project has less than a week to go and needs the support. Go check it out. And now, ladies and gentlemen, Steven Schend. Aces & Eights, AD&D, Aeon, Aftermath!, Agone, Alma Mater, Alternity, Amazing Engine, Amber, Arcanum, Aria (Canticle of the Monomyth), Ars Magica, Avengers of Justice, Battlelords of the 23rd Century, Big Eyes, Small Mouth, Blue Planet, Blue Rose, Brave New World, Buck Rogers High Adventure, Buck Rogers XXVC, Buffy the Vampire Slayer, Bunnies and Burrows, Bureau 13, Burning Empire, Burning Wheel, Cadillacs and Dinosaurs, Call of Cthulhu, Castle Falkenstein, Castles & Crusades, Chainmail, Champions, Chill, Conan, Continuum, Crimefighters, Cyberpunk (all incarnations), Cyborg Commando, D&D (all incarnations), D20 Modern, Dallas, Dangerous Journeys, Dark Conspiracy, Dark Matter, Darksword Adventures, Darkurthe Legends, DC Heroes, DC Universe, Deadlands, Delta Green, Diaspora, Doctor Who, Dogs in the Vinyard, Dragonquest, Dragonstrike, Dream Park, Dune, Dying Earth, Dyvil. Earthdawn, Elric!, Encounter Critical, Empire of the Petal Throne, (including Swords & Glory, Gardasiyal, and Tekumel), Engel, Exalted, Fantasy Hero, Fantasy Trip, Feng Shui, Fifth Cycle, Flashing Blades, Fringeworthy, FUDGE, Gamma World (all incarnations), Gear Krieg, Gemini, Ghostbusters, Godlike, Golden Heroes, GURPS, Hackmaster, HARP, Heavy Gear, Hero Wars, HeroQuest, Hollow Earth Expedition, Houses of the Blooded, Human Occupied Landfill, Humanspace Empires, Indiana Jones, Iron Kingdoms, Ironclaw, Ironhedge, It Came From the Late, Late, Show, James Bond 007, Justifiers, Kult, Labyrinth Lord, Lamentations of the Flame Princess, Legacy: War of Ages, Legend of the Five Rings, Legionnaire, Leverage, Lord of the Rings, Lords of Creation, Macho Women with Guns, Mage: The Ascension or Awakening, Marvel Super Heroes, Marvel Universe, Masterbook, Mecha, Mechanoid Invasion, Megatraveller, Mekton, Men In Black, Mercenaries, Spies, and Private Eyes, MERPs, Metascape, Monsters! Monsters!, Mouse Guard, Mummy, Murphy’s World, Mutant Chronicles, Mutants & Masterminds. Nephilim, Ninja Burger, Nobilis, Noir, Orkworld, OSRIC, Pandemonium, Pathfinder, Pelicar, Pendragon, Pokemon the RPG, Powers and Perils, Price of Freedom, Primal Order, Prince Valiant, Privateers and Gentlemen, Rifts, Rise of Aester, Rocky and Bullwinkle, Rolemaster, Run Out The Guns!, Rune, RuneQuest, Rus, Sandman, Savage Worlds, Serenity, Seventh Sea (yeah, its 7th Sea, but I’m not doing numbers), Shadowrun, Shatterzone, SLA Industries, Smallville, Sovereign Stone, Space 1889, Space Opera, Spirt of the Century, Spycraft, Star Ace, Star Frontiers, Star Trek, Star Wars, Stargate SG-1, Stormbringer, Super Squadron, Superhero 2044, Supernatural, Swashbucklers of the Seven Skies. Tales from the Floating Vagabond, Tales of Gargentihr, Teenage Ninja Mutant Turtles, Teenagers from Outer Space, The End, Thieves’ World, Thousand Suns, Timemaster, Toon, Top Secret, Top Secret/SI, TORG (The Other Roleplaying Game), Trail of Cthulhu, Transhuman Space, Traveller (Many incarnations),Twilight 2000, Underground, Unknown Armies. Vampire (Masquerade, Requiem, Dark Ages, et. al.) Victoriana, Warcraft, Warhammer FRP, Weapons of the Gods, Weird Wars, Werewolf, Wheel of Time, World of Darkness (in all incarnations), World Tree, Wraith, Wyrd is Bond, X is STILL available at very reasonable rates. On the other hand, I COULD just do Monsters, or Novels, or Comic Book Characters next time.